A Catholic, virtue building boys club called CONQUEST . Our Club visited Crossroads Pregnancy Center to learn about the compassionate and life saving work they do for mothers and the babies in need. We decided to help promote their mission and we designed the above billboard that promotes the best birthday present ever - LIFE! When will our project be implemented? -If we raise $2,000 we can get our image on ONE side of the sign. -If we raise $4,000 we ca get our image on ALL THREE sides of sign! Where will our project be implemented? On the HUGE three-sided digital billboard at the intersection of 309 and 313 – Near the Giant in Quakertown. Click here to see our Club's mock-up of what the completed billboard design will look like . Ultimately to put and end to abortion. 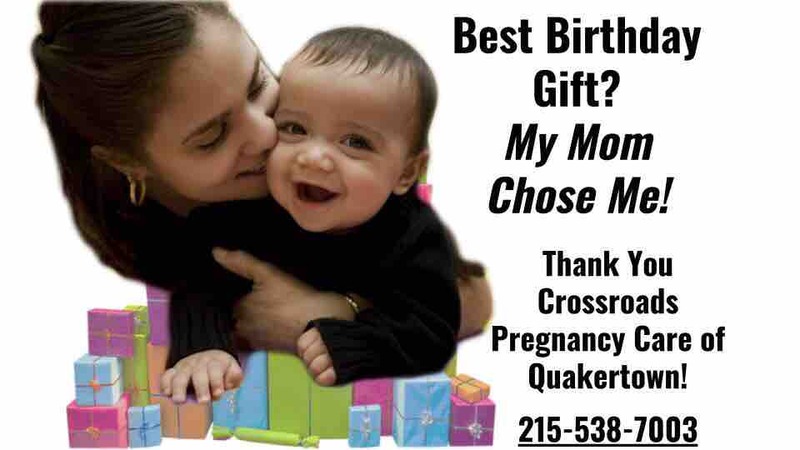 But mainly to give mothers in need another option, to receive help to love and care for their child, and to promote Crossroads Pregnancy Care. 2. Please like and share our GoFundMe campaign on your social media and by email to help spread the word about the BEST PRESENT EVER for babies and mom's in need! THANK YOU!!!!!! Because of YOUR generous support and your commitment to LIFE, we were not only able to reach our $4,000 goal --- we EXCEEDED it!!! Please watch our below BIG ANNOUNCEMENT video :-) uUr billboard goes live on the 3 BIG screens on Monday, 3/18/19 at 6:00 am. Even more exciting is that the billboards were supposed to run for 4 weeks -- but the billboard company was so excited and inspired by our Conquest Club's efforts that they gave us a BONUS week! WOO HOO! So the billboard will be up for the entire Lenten season including HOLY WEEK! The final day for the ads will be Easter Sunday - a Holy perfect final day indeed. So thank you ALL once again for your commitment to LIFE. Because of you, God-willing, moms in need will see the message about the greatest present ever - LIFE and they will reach out to Crossroads Pregnancy Center for HELP and HOPE! May God Bless you once again for He has blessed all of us and hopefully many more with you! This is the billboard design! Thank you for helping us raise the funds to make this a reality!